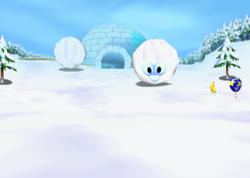 Snowball Valley is the third race course of Snowflake Mountain in Diddy Kong Racing and its remake Diddy Kong Racing DS. It gets its name from the giant snowballs with eyes which roll through part of the track, crushing any racers that collide with them. The track's other features include a fork in the road, icy water which causes cars to bounce, and an igloo with green crystals inside. In the Nintendo DS remake, the icy water no longer bounces cars and instead behaves like normal water. There is a portrait of Diddy above the entrance to the igloo, and the crystals inside the igloo are different colors instead of just green. It also has its own music, while in the Nintendo 64 version it shares its music with Everfrost Peak. There is a fork in the road at the beginning of this track. The left path has a blue balloon at the start and goes into a narrow cave, which features a right turn, a left turn, and another blue balloon. The racers turn right upon exiting the cave. The right path has red and green balloons at the start immediately followed by a left turn. The path here is jagged and surrounded by icy water, which will cause cars to bounce and have to regain speed but can be driven over safely with hovercrafts. After the racers make a right turn and drive off a ledge, this path merges with the left path. The road curves gently to the right and features a Zipper on the right followed by a small arch with some blue and yellow balloons under it. Ahead of the arch is a wide open snowfield with giant snowballs rolling around the middle of the track which can flatten racers, slowing them down. There is a blue balloon on each side of the road. 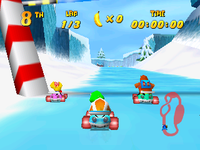 Afterward, the racers go into an igloo, which contains a slight left turn followed by a sharp right turn. Right before exiting the igloo, there is a Zipper on the left, and right after it is a set of five balloons: two blue, two red, and one green. After one more right turn, the racers complete the lap. Snowflake Mountain's Wish Key is found in this level, just before the starting line. Right before the fork in the road. At the entrance to the cave on the left path. On the left side of the road on the right path, near the ledge drop. On the right side of the road after the two paths converge. Under the arch, right before the balloons. On the left side of the snowball section. On the right side of the snowball section. On the left side of the road right before the finish. Since the track is mirrored, the right path is now the left path, and vice-versa. On the right path, near the arrow sign. On the left path, near the icy water. Right before the ledge drop on the left path. At the bottom of the ledge. At the bottom of the slope that leads into the snowball section. Near the igloo in the snowball section, on the left. Near the igloo in the snowball section, on the right.